Brian James became Solo English Horn and Second Oboe with Symphony Nova Scotia in 2005. He is often featured as a concerto soloist with the orchestra and premiered J.S. Bach’s Oboe d’amore Concerto in A Major in 2013. 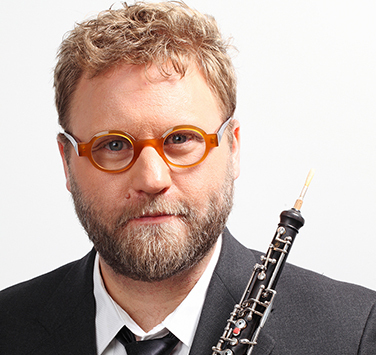 Prior to his appointment in Halifax, Brian performed regularly as Principal Oboe with the Kitchener-Waterloo Symphony Orchestra, Opera Lyra Ottawa, and the Windsor Symphony Orchestra. He has also performed with the Toronto Symphony, Buffalo Philharmonic, Virginia Symphony, and the Canadian Opera Company Orchestra. Brian has recorded extensively with baroque music specialist Kevin Mallon and the Toronto Chamber Orchestra, as well as the Ontario-based woodwind octet The Festival Winds for Naxos and CBC, respectively. He can often be heard in solo and chamber music recitals across the Maritimes. Brian teaches oboe at Dalhousie University and has previously held teaching positions with Wilfrid Laurier and Acadia Universities. He is a sought-after reed maker and offers workshops and lessons in this unique craft. Brian is originally from Washington, D.C. and comes from a large family of professional musicians. He holds degrees from the Florida State University School of Music and the Carnegie Mellon University College of Fine Arts in Pittsburgh, Pennsylvania.